North Korea has continued to work on its missile and weapons programs even after President Trump declared his summit meeting with Kim Jong-un, the country’s leader, a success. President Trump has consistently touted the results of his North Korean diplomacy, insisting since his June summit meeting with Kim Jong-un that Pyongyang is no longer a nuclear threat and noting that its missile tests have stopped. But like other foreign policy assertions from the White House, reality has proved more complicated. North Korea has continued its work on missile and weapons programs since the leaders met, American officials say, including manufacturing new intercontinental ballistic missiles at a facility near Pyongyang, the capital, according to one Defense Department official. And North Korea continues to produce nuclear fuel, Secretary of State Mike Pompeo told senators last week. [post_ads]Mr. Kim has little interest in giving up the North’s nuclear arsenal or rolling back its progress on ICBMs, experts who have long studied North Korea’s government and its missile programs believe. The North’s weapons work, including at a facility that creates ICBMs, has continued in the weeks after the summit meeting between Mr. Trump and Mr. Kim, said Jeffrey Lewis, an arms control expert at the Middlebury Institute of International Studies at Monterey in California. American officials said they have not seen an increase in work in recent weeks but have watched the programs proceed at the same pace as in previous months. In particular, work on one to two ICBMs at Sanumdong, a missile manufacturing facility on the outskirts of Pyongyang, is consistent with the facility’s activity before the summit meeting, the Defense Department official said. The work on the new missiles was first reported by The Washington Post. Some Trump administration officials have been frustrated that North Korea has continued its weapons work, viewing it as a violation of the spirit of the agreement between Mr. Kim and Mr. Trump. But other American officials and outside experts said it should have been expected that North Korea would continue work at its missile facilities because Mr. Kim made no explicit agreement to halt the manufacturing of its missile systems or nuclear fuel. The North’s big investment in its nuclear program in recent years made it unlikely that it would undertake an abrupt change of gears, Mr. Lewis said. Since Mr. Kim came to power, there has been a steady increase in North Korea’s investment in missile technology and nuclear arms. Mr. Trump has played up the results of his meeting with Mr. Kim, posting on Twitter afterward: “There is no longer a Nuclear Threat from North Korea.” Since then, Mr. Trump has said that North Korea has made progress in the promises that Mr. Kim made to him. But diplomacy between the two nations has been halting. Weeks after the summit meeting, North Korea accused the United States of making “gangster-like” demands. Mr. Pompeo is expected to try to shore up the relationship by continuing diplomatic work with North Korea this week at the ASEAN Regional Forum in Singapore. State Department officials said denuclearization will be discussed in a multinational setting, but would not say whether Mr. Pompeo and North Korean officials would meet directly for discussions. Testifying before the Senate last week, Mr. Pompeo said that North Korea continues to make “fissile material,” in essence the fuel for nuclear weapons. Democrats challenged Mr. Pompeo, saying Pyongyang had only rid itself of an obsolete facility. And outside experts have taken issue with Mr. Trump’s and Mr. Pompeo’s insistence that diplomacy is on track and the threat of conflict is substantially diminished. The Trump administration’s foreign policy has repeatedly been at odds with pronouncements by the president. Mr. Trump said he won new spending concessions from European leaders in July, only to have allies counter that they had made no additional promises. And months after pulling out of the Iran nuclear agreement, Mr. Trump said he would meet Iranian leaders without preconditions. Hours later, though, Mr. Pompeo outlined several. But the proposal was in any case rejected by Iran. On Russia, the president has insisted that he has pursued tough policies, though a Senate vote that pushed through additional economic sanctions forced the administration’s hand. Mr. Trump has changed his position repeatedly on his views of Russian interference in American democratic institutions, despite intelligence agencies consistently saying Moscow continues to meddle. As for North Korea, scholars have also cast doubt on the government’s true intentions, and the new disclosures have sown further doubts about the Trump administration’s progress in stripping the country of its nuclear weapons. Mr. Lewis said his organization has examined 40 images of the Sanumdong facility since January. They show work continuing at the facility that was used to develop the ICBMs possessed by North Korea that have the capability to strike the United States. 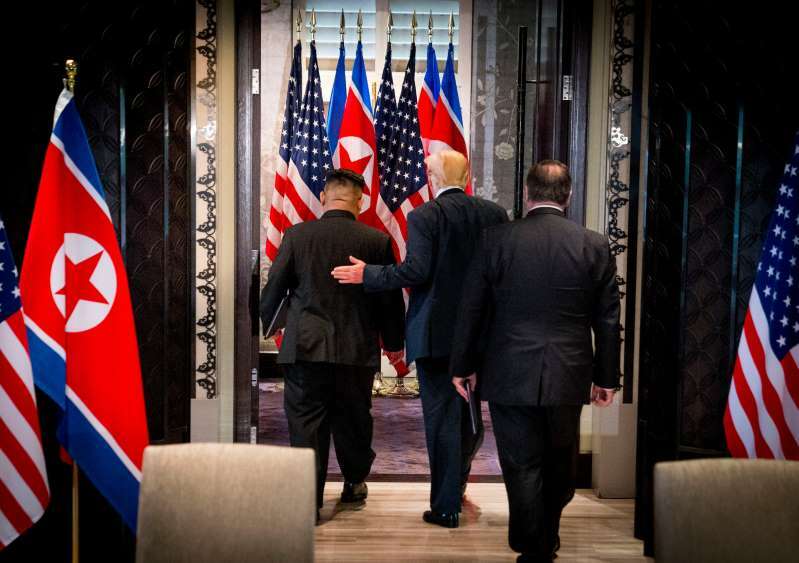 Still, Mr. Klingner noted, North Korea agreed at the summit meeting only to work toward denuclearization, a weaker phrase than past agreements involving Washington and Pyongyang. Commercial satellite photographs have shown work at missile and nuclear sites continuing and have demonstrated Pyongyang’s determination, for now, to maintain its nuclear program, he said. “One would think they wouldn’t be continuing or ramping up production if they are getting ready to abandon these programs,” Mr. Klingner said. Experts believe that North Korea, at least for now, has little intention of giving up its nuclear weapons or ICBMs. Instead, it hopes to reach a deal where it can retain its nuclear arsenal and ICBMs, but end any high-profile tests or other public threats. At the Senate hearing, Mr. Pompeo told lawmakers that he was “very confident that the North Koreans understand our definition of denuclearization” and that Pyongyang had agreed to denuclearize. While the Trump administration has defined the term “denuclearization” as the elimination of the nuclear arsenal, North Korea means something far different, Mr. Lewis said. When North Korean officials talk about denuclearization, they mean reducing the role nuclear weapons play, he said. “They want the Israel deal: They will talk about them less, and we pretend they don’t exist,” said Mr. Lewis. Israel is not a globally declared nuclear power, and the government does not discuss its abilities, but its weapons are hardly a secret.